I went to see Fast and Furious 7 when the movie trailer for N.W.A came on. 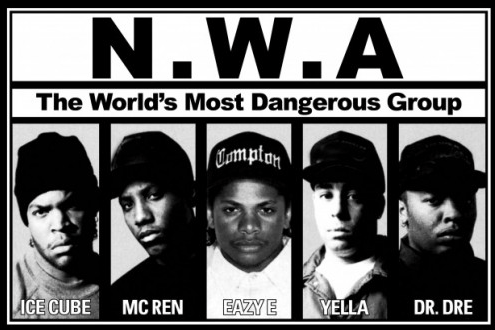 N.W.A was one of the most notorious rap groups of all time. These five master minds created some of the greatest rap songs to this day. They were telling a story about how life in Compton was everyday through their music. People disliked N.W.A because some though they were glorifying killing, gangs, drugs and money. These five men became successful enough to get their lives out of the streets and made a statement to people around the world they could not be stopped.